Major construction work for the project was completed in November 2017. Contractors addressed punch list items in early 2018 and project closeout is underway. 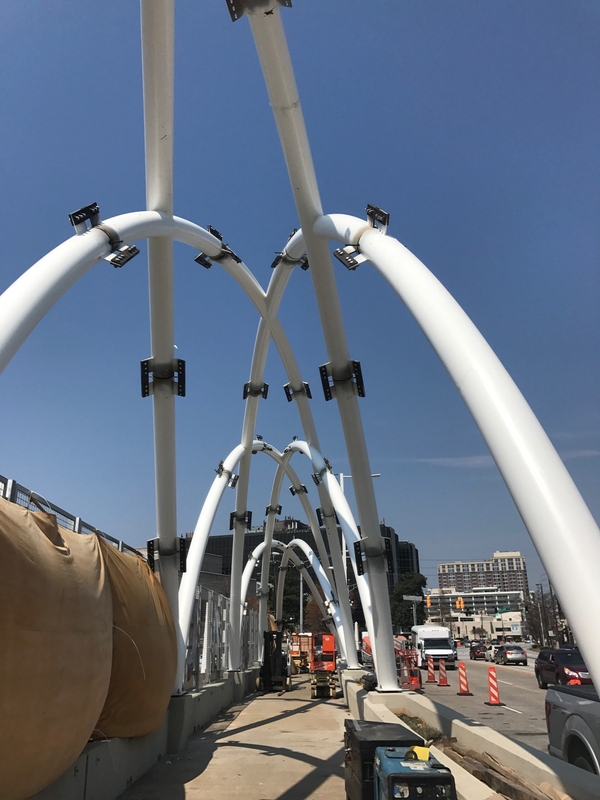 The considerable size of the 30-foot tall arches required more space for assembly, and Midtown Alliance and its team of contractors took steps to ensure installation was as expedient as possible. 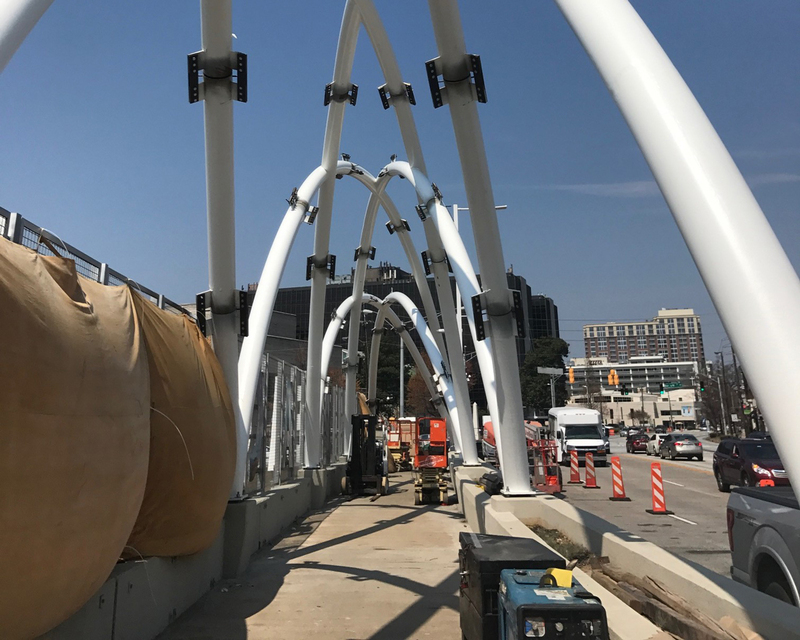 To lessen the impact on the traveling public, the arches were assembled off-site initially, then disassembled and shop painted. 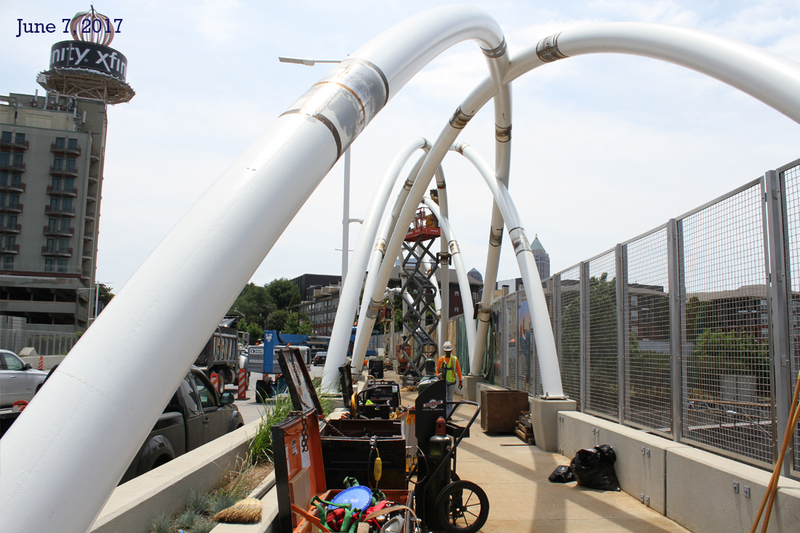 The arches were transported to the site to be installed on one side of the bridge at a time. 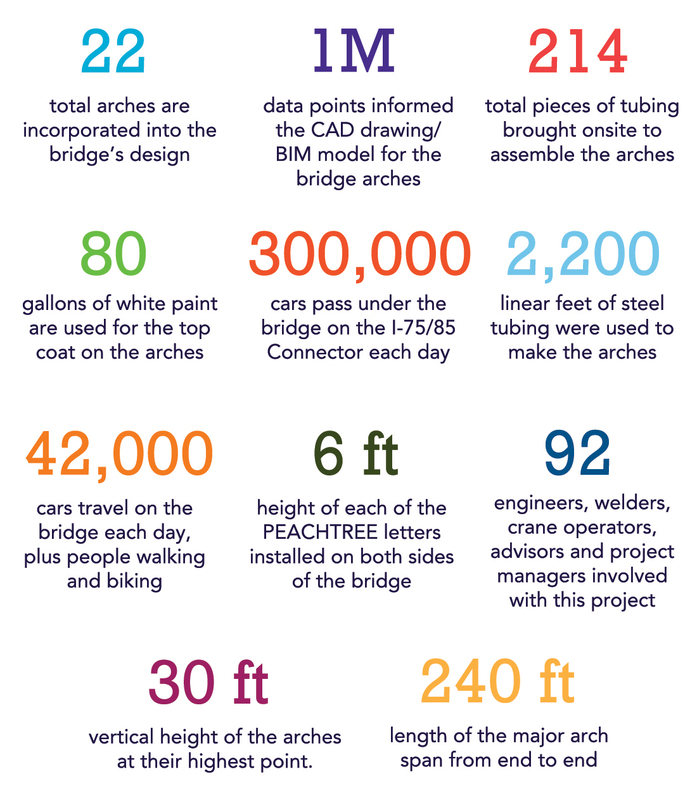 The first arch segments arrived on the bridge in March 2017. 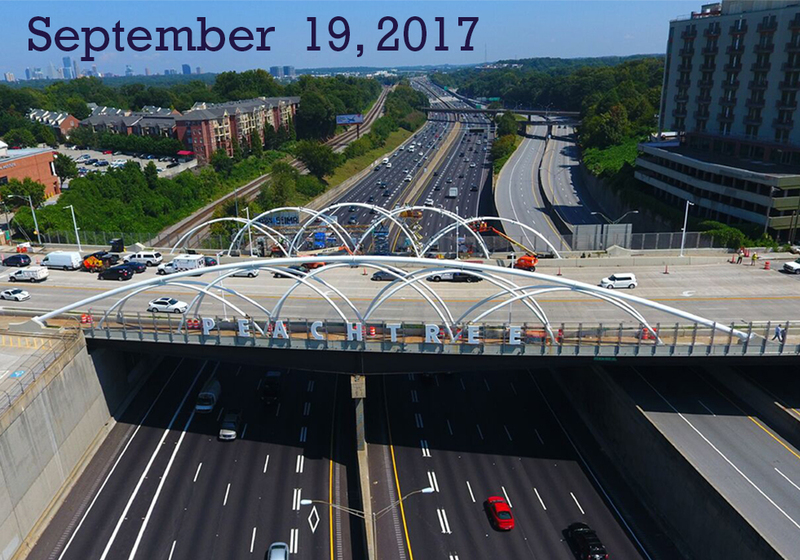 All 10 minor arches had been erected and bolted in place on the left (southbound) side when work was suspended for over 6 weeks while the Georgia Department of Transportation (GDOT) repaired the elevated section of I-85. Work resumed in June to finish welding the minor arches. 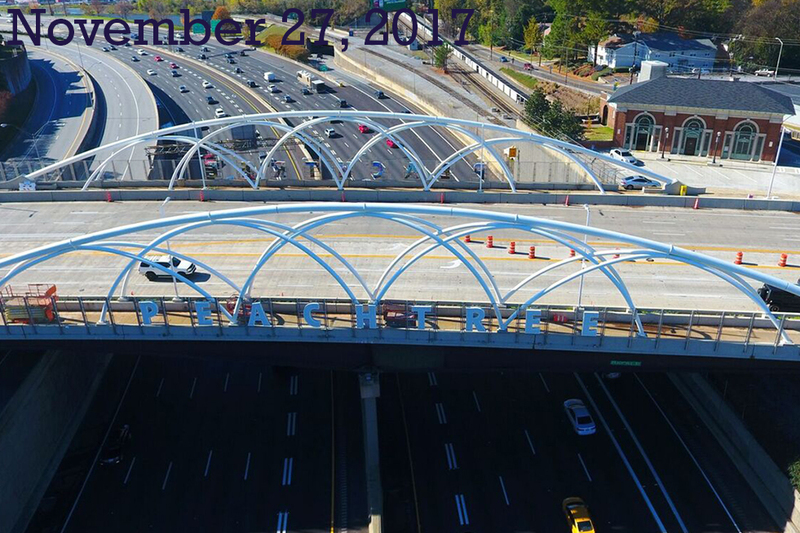 The southbound major arch -- a single span atop the minor arches -- was erected and welded in July, including touch-up paint to substantially complete the southbound (left-side) arches. 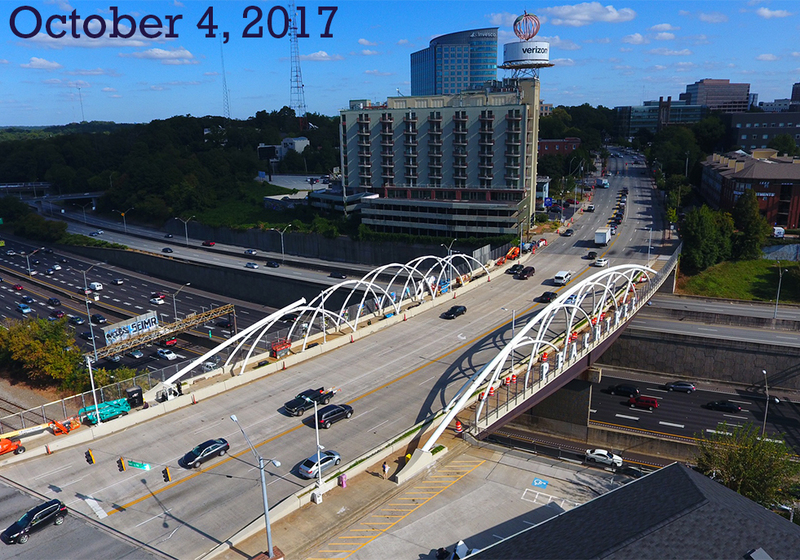 Contractors moved to the northbound (right) side of the bridge in August and erected, welded, and painted the 10 minor and 1 major arches in the same sequence that was used on the completed side of the bridge. 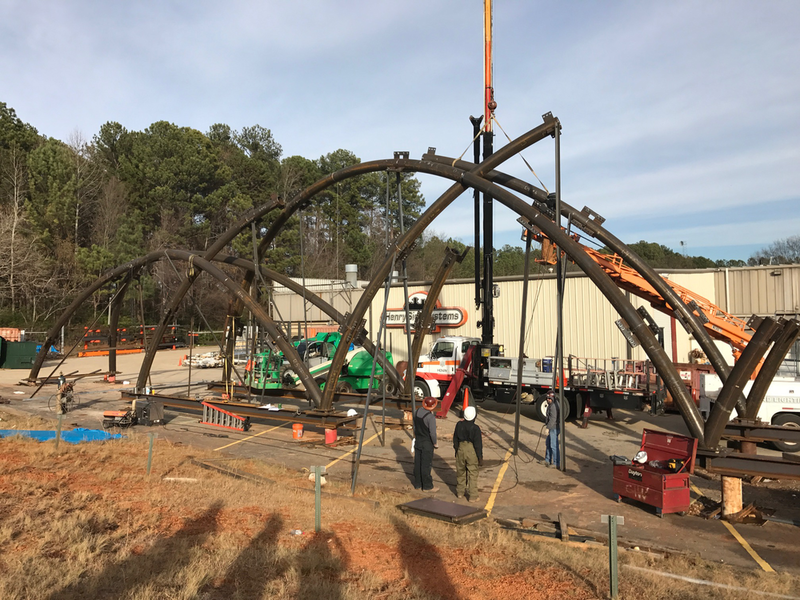 Every segment, angle, joint, and weld assembling the 22 total arches is unique. 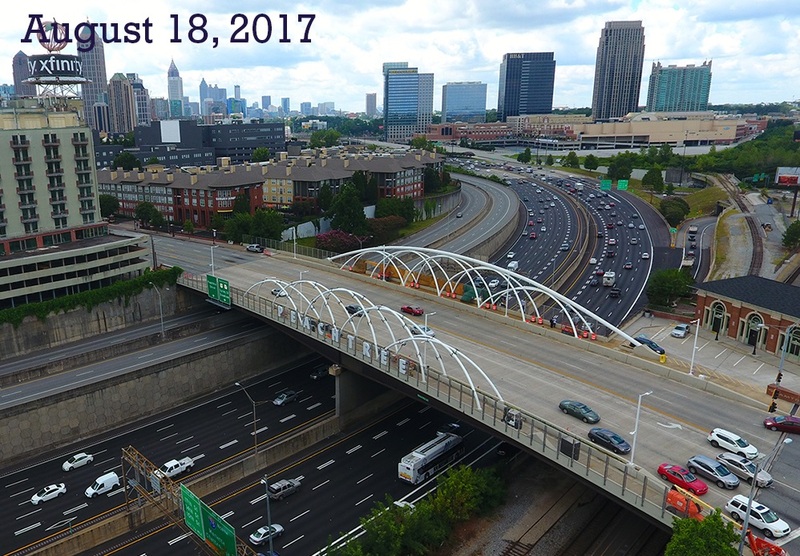 Prior to the I-85 bridge collapse, the project was expected to be completed by the end of April 2017. The project later experienced several work moratoriums due to holidays and Hurricane Irma. 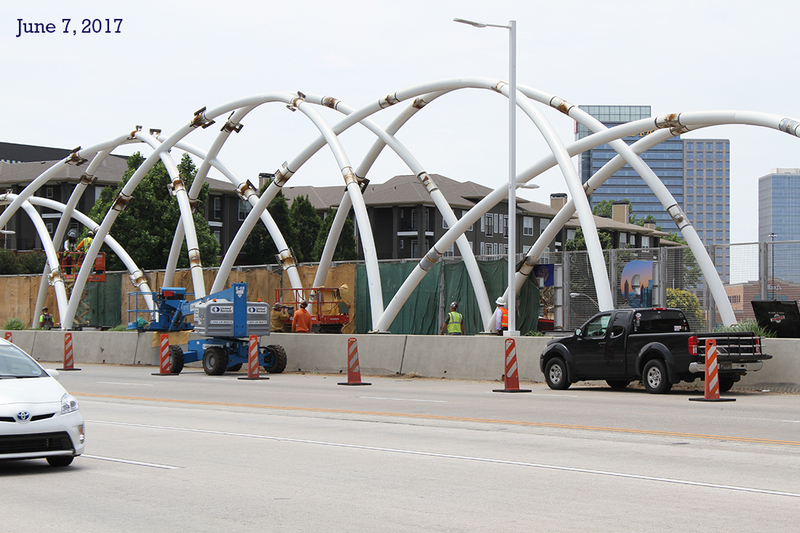 This is one of the most sophisticated structural engineering projects Midtown Alliance has ever undertaken. 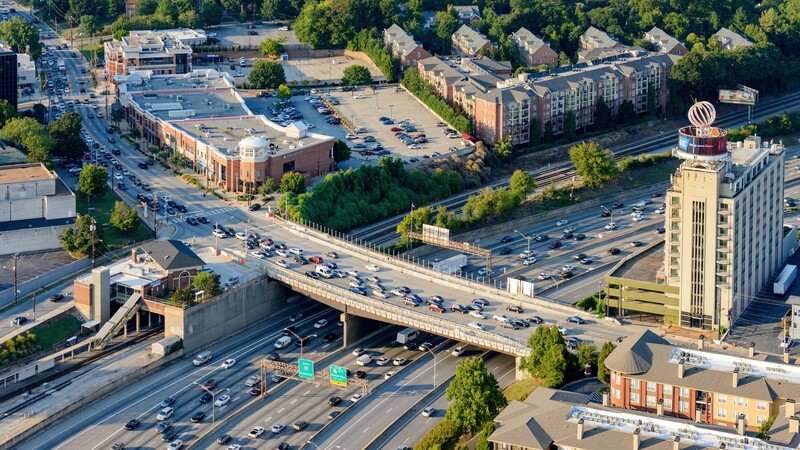 We understand the inconvenience motorists feel, as some of our staff travel in that corridor as well, and we appreciate everyone's patience as we worked expeditiously - and with great care - to complete this work. 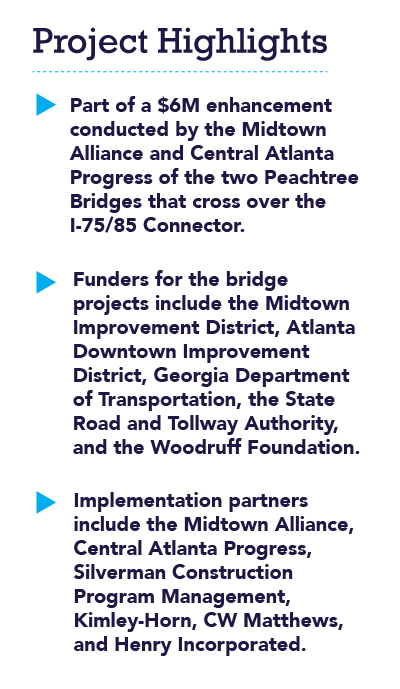 Concurrently, Midtown Alliance and Central Atlanta Progress (CAP)/Atlanta Downtown Improvement District, directed a $6 million enhancement of the two Peachtree Street bridges which cross over the Interstate-75/85 Connector near the Brookwood split and Ralph McGill Boulevard respectively. 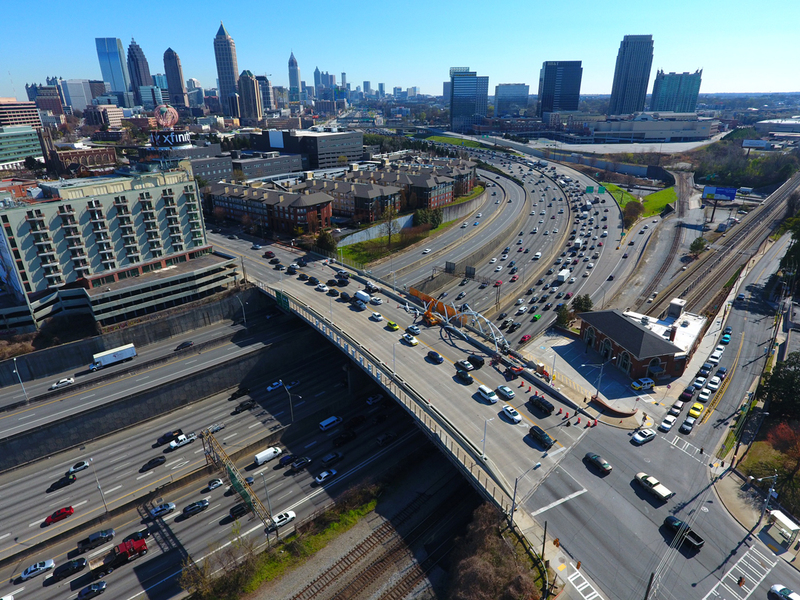 This effort improves access for people crossing the bridges on foot and by bike, and leverages the bridges on either end of Midtown as gateways to Atlanta's urban core. 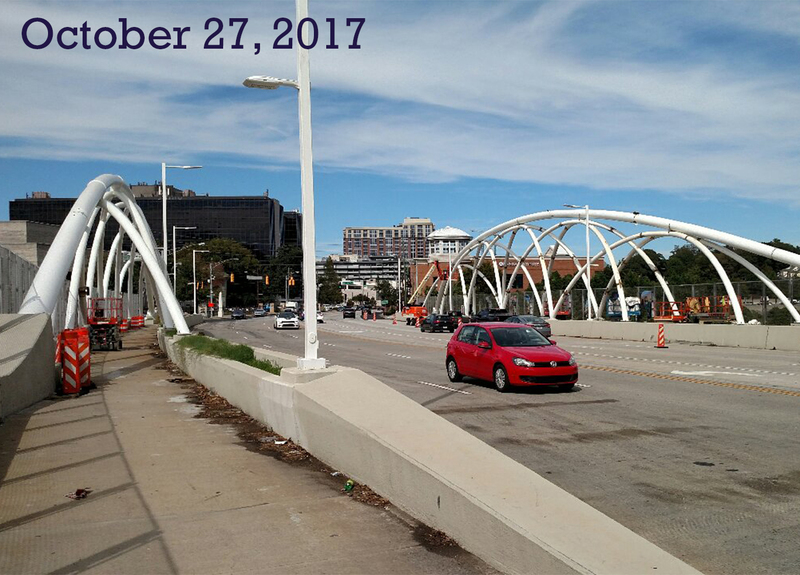 Construction began in Fall 2015 and included installation of new barrier-separated sidewalks, landscaping, decorative bridge fencing, lighting, bridge joint work and gateway features. Phase 2 enhancements unique to the North bridge feature 30-foot tall steel gateway arch elements. 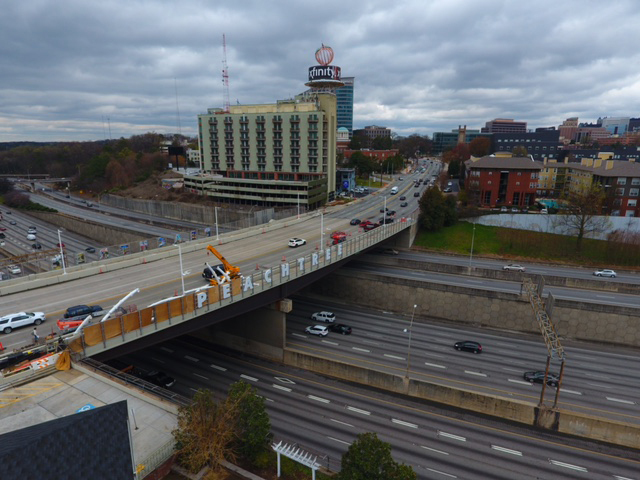 The signage featured on the North bridge provides a bold visual impact, identifying Peachtree Street to the more than 300,000 motorists passing beneath each day on the I-75/85 Connector. 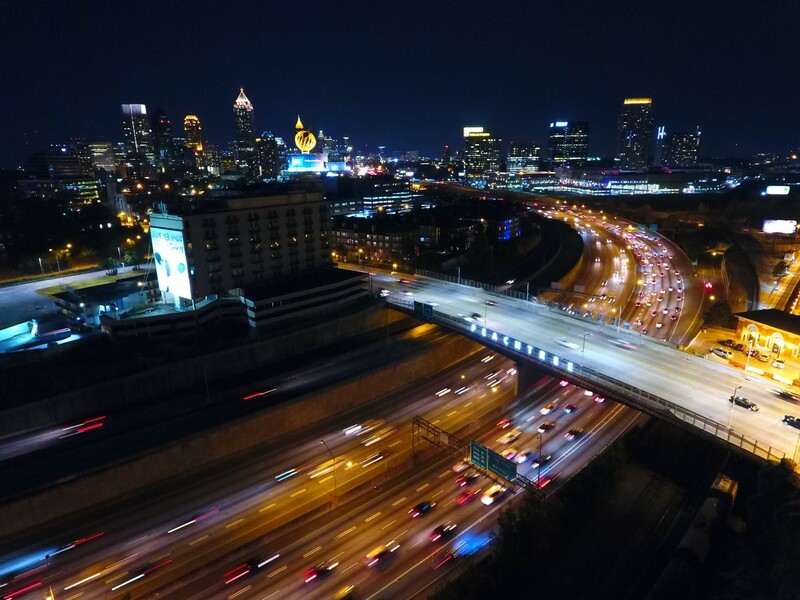 These also include a topside, pedestrian-facing exhibition of photography from Atlanta photographers Gene Phillips and David Kosmos to celebrate Midtown’s most famous landmarks. 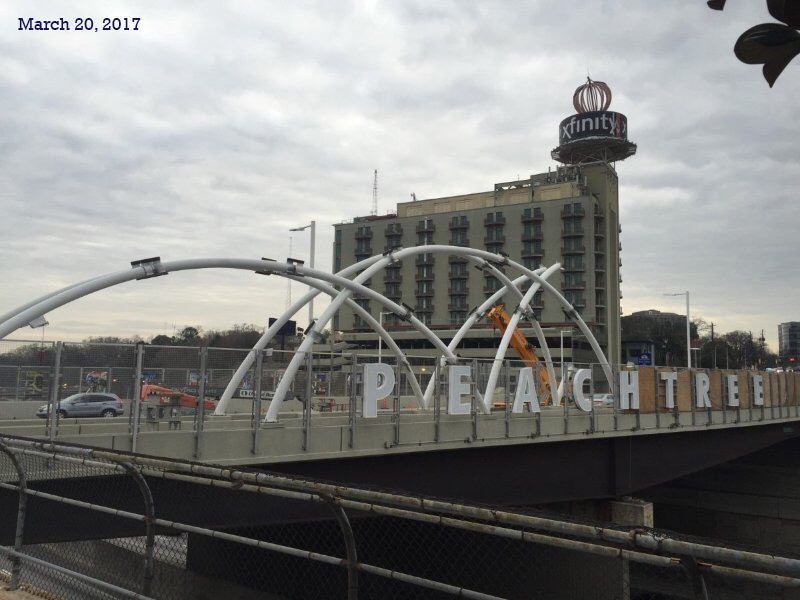 The North Bridge's counterpart on the District's southern end also features the letters and photography with images representative of Downtown Atlanta landmarks.